Monica and Josiah Have been looking for new opportunities to grow over the last several months. Finding all the right pieces to grow has and continues to be the dictating factor for opening our next facility. Enough pieces have fallen into place that we can announce our intention to open in Wausau. The facility we have in mind would duplicate the size and tone of our Marshfield Satellite. To begin, we would develop it as a wellness spa; with yoga, salon, skin, and nails all as future options. The facility lies on 17th right across from Marathon Park. Everything is set for us to sign a lease except for new staff. If we can find two full-time massage therapists or the equivalent to join our Wausau Team, we will open later this spring. Who would fit in well with our Team? Back To Bliss is a facility that honors the individual strengths of our team members. We offer a wide array of massage techniques from deeply technical therapy to blissful relaxation. As a facility we allow you to focus on your strengths. Our team will help direct clients to you that best fit your strengths. We create a team environment that is client service oriented, not competitive amongst therapists. Through cooperation and professional teamwork, we build a much more powerful experience for our clients. This means we are looking for long term career minded therapists as well as team oriented ones. Our system of pricing on a leveled bases helps therapists receive timely raises. It also provides information on the experience level clients should expect when they choose a provider. This clarity honors both our team member’s growth in their careers as well as client preferences on price and experience. We look to attract long-term relationships with clients. We are not a resort spa or a medical clinic, but a facility focused on balanced wellness; providing great clinical massage therapy in a spa-like atmosphere. Our multiple facilities, with their different departments, offer options for our clients to pursue wellness on their own terms as part of a lifestyle focused on health and happiness. To this end, therapists that can build positive therapeutic relationships with their clients find our philosophy and tone a good match. If you are solely focused on specialty populations or have no interest in building longer term clients, then you will find a better home elsewhere. While still a small business, Back To Bliss offers support that many employers do not for massage therapists. We have regular team meetings with in-house education. We encourage you to trade and learn from other therapists during your down time. Public classes taught by in-house teachers all have discounts or are free to team members. This summer we are offering yoga, Bach Flower, Your First Meditation, and Reiki Certification classes to name a few of the options for staff. As a whole, the potential for your personal growth in our team atmosphere is a real part of why people stay with us. Our philosophy is based in holistic wellness and the atmosphere we create for our team members is as relaxed as we can make it while still holding accountability for success and professionalism. Our focus on your personal growth is great for self-motivated people who want to learn their craft and then learn how to help more and more people. We offer flexible schedules, phone app based schedule and online booking system, significant levels of autonomy/respect/responsibility, and support. In short, you need to have a relatively stress-free work environment to grow and provide stress relief to our clients. We offer commission based pay for both retail and services. All new team members have an hourly minimum wage as they build their clientele and will receive whichever is greater, their commission amount or their hourly. This supportive structure eases the transition into any new facility while client relationships are built. We are a profit share based model. Everyone earns their regular wage for work, and as each facility reaches higher levels of success, larger and larger portions of profit will be returned to the team members. We all share in the success of positive work habits. Profit sharing is available after 2 years of employment. Contact our front desk at 715.316.0040. Our receptionists will provide you with an email to send resumes and give your contact information to our Owners, Josiah & Monica. Training begins asap at our Colby location. Our March 2017 promotion is our Annual Perm Sale. This offer is good for 15% OFF any perm, including specialty wraps, during the month of march, 2017. 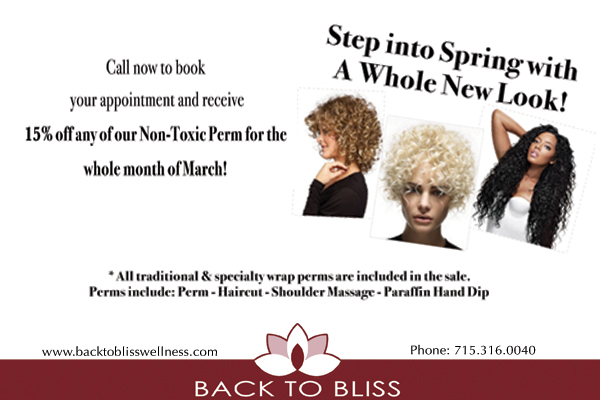 Enjoy the latest fashion with a perm at Back To Bliss. Our stylists are up on the latest trends, and perms are back in style! Come get yours today.